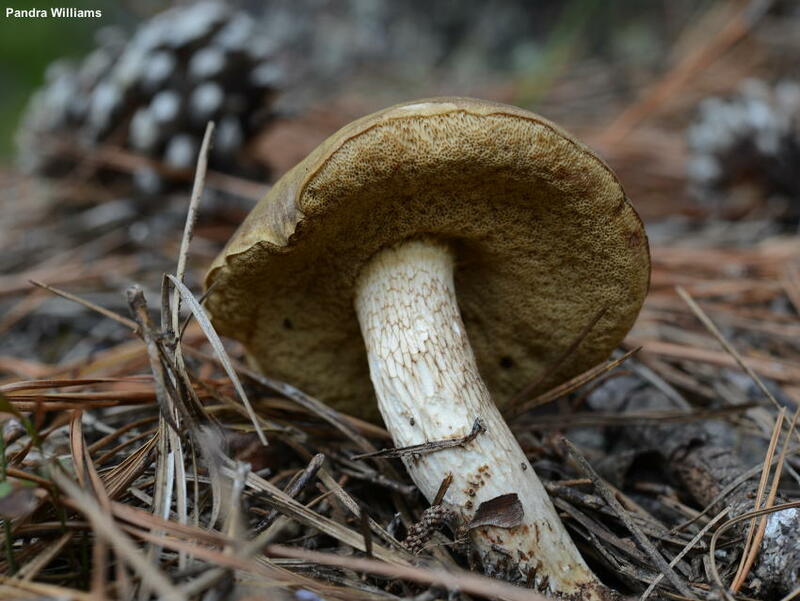 Found under pines along the East Coast and in the southeastern United States, this interesting bolete features a gray cap, a prominently and widely reticulate stem, and white flesh. It is very similar to the better-known Retiboletus griseus, but the latter species associates with oaks, has a stem that turns bright yellow from the base upward, and features smaller spores. 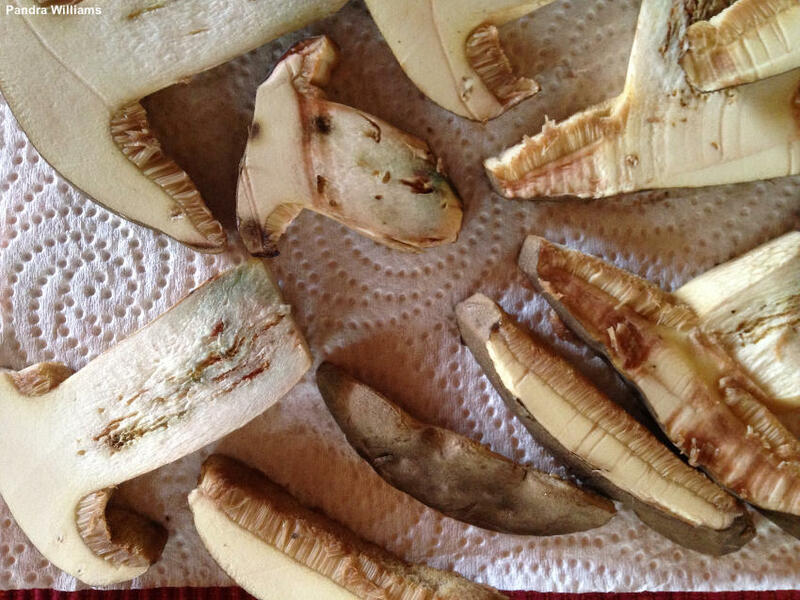 Additionally, the flesh of Retiboletus fuscus turns slowly pinkish to reddish when sliced, its stem develops red discolorations, and, under the microscope, its pileipellis is distinctive and gorgeous. 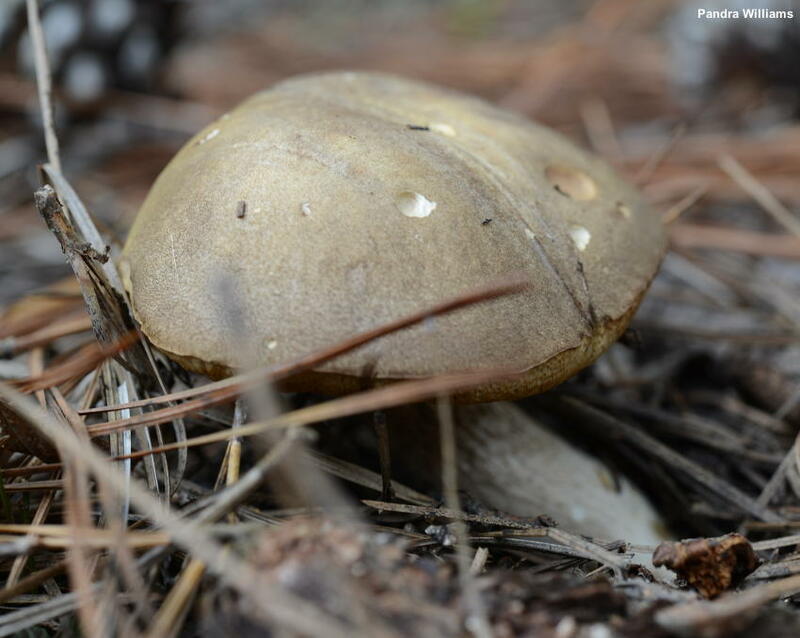 A recent study by Zeng and collaborators (2016) promoted Retiboletus fuscus to the level of species; it had previously been considered a variety of Retiboletus griseus (Retiboletus griseus var. fuscus). Although this taxon was originally described from Japan (Hongo, 1974), the name has been applied by Bessette, Roody, and Bessette (2002, 2016) to North American collections—and Zeng and collaborators apply the name to collections from southwestern China. Now the bad news. 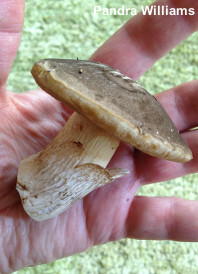 I doubt that Retiboletus fuscus actually occurs in North America. For one thing, the original Asian species has a dark gray to nearly black stem. More problematic, however, is the idea that a mycorrhizal species would be naturally populated in the southeastern United States and in Asia. It is more likely that our North American fuscus-like species is unnamed but very similar to the Asian species. 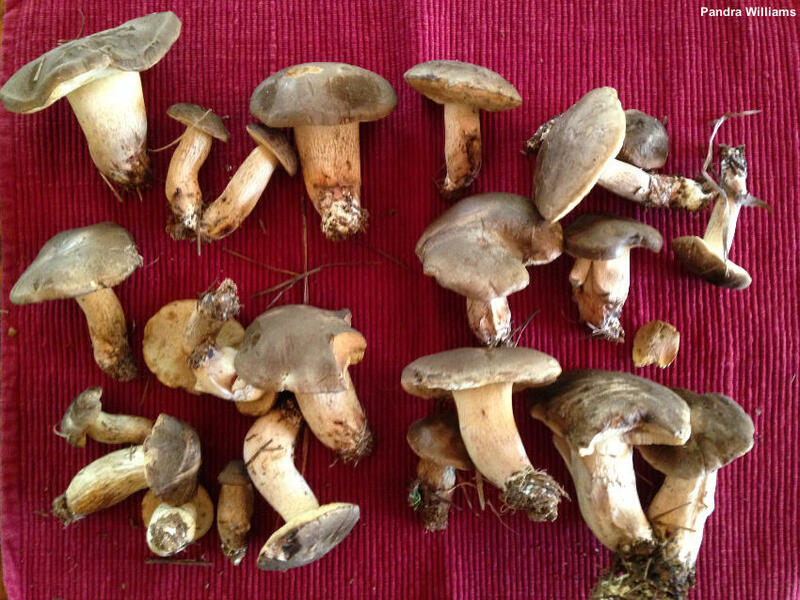 Thanks to Pandra Williams for collecting, documenting, and preserving Retiboletus fuscus for study; her collection is deposited in The Herbarium of Michael Kuo. Ecology: Mycorrhizal with pines; growing alone, scattered, or gregariously; summer and fall; reported by Bessette, Roody & Bessette (2002, 2016) from Massachusetts, Florida, North Carolina, and Virginia. The illustrated and described collections are from Georgia. Cap: 5–9 cm; convex, becoming broadly convex; dry; very finely velvety when young, becoming more or less bald; grayish brown to dark grayish brown. Pore Surface: Whitish to creamy, becoming brownish yellow with age; bruising slowly brownish; with 2–3 round to angular pores per mm; tubes to 15 mm deep. Stem: 5–9 cm long; 1–2 cm thick; more or less equal, or slightly tapered to the base; prominently reticulate over the upper half or overall with a wide-meshed, brownish to brown reticulum; whitish to pale tan, developing red to purplish red stains and discolorations; solid; basal mycelium white. Flesh: White; firm; staining slowly pinkish to reddish in places when sliced. Chemical Reactions: Ammonia dull orange on cap surface. Spore Print: Brown with a slight hint of olive. 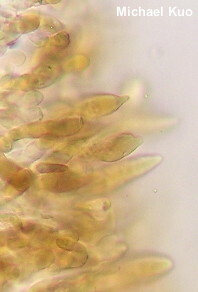 Microscopic Features: Spores 11–15 x 3.5–4.5 µm; fusoid; smooth; yellowish in KOH. 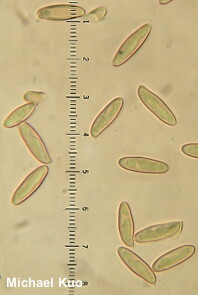 Hymenial cystidia 25–40 x 7.5–10 µm;; lageniform; smooth; thin-walled; golden or brownish golden in KOH. 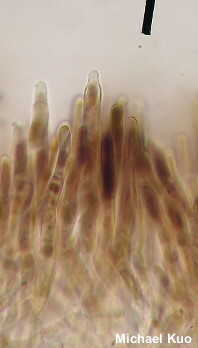 Pileipellis a trichoderm; grayish brown to brown or dark brown in KOH; elements 5–12.5 µm; wide, smooth, thin-walled; terminal cells clavate, cylindric with rounded or narrowed apices, or cystidioid and subfusiform. REFERENCES: (Hongo, 1974) Zeng et al., 2016. (Hongo, 1974; Bessette, Roody & Bessette, 2000; Bessette, Roody & Bessette, 2016; Zeng et al., 2016.) Herb. Kuo 10191302, 09261402.